I have just received and unwrapped my shiny new Numark AVM02 mixer. Unfortunately way too late for the 3 gigs I had over the weekend, so it will be a week or so until I have a hands-on, performance review. In the meantime though, I have plenty of first impressions. It’s shiny. It’s big (19″ rack standard). Build quality is very solid – no surprises there – and all faders, knobs and buttons feel like they’re attached to a professional mixer. The crossfaders are a little slow, needing to be pushed all the way across rather than travelling there with a flick, and the lack of “transform” buttons rules out some fun mixing tricks which can be performed with the V4, but perhaps this will encourage me to develop better crossfader technique. It has many inputs and outputs. Ignoring the audio stuff for now (which is so passe darlings) we have 4 S-Video and 4 Composite in (not switchable, not sure how it selects between them). 2 S-Video and 2 Composite out, and 4 composite monitor outs. 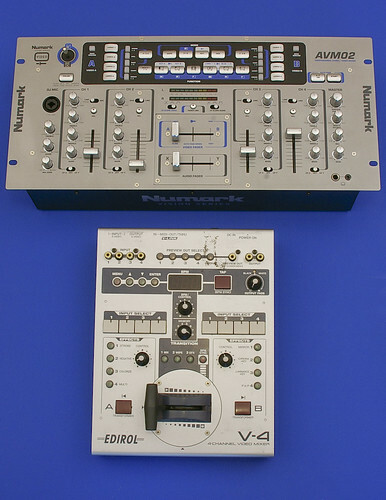 Put it next to the V4 and one thing is instantly apparent: You’re getting a lot of mixer for your money. Obviously it’s very much a DJ-centric unit, and doesn’t have the vision mixer hallmarks such as T-bar fader, take/transform buttons or menu navigation. Nor does it have the useful automation stuff like BPM tap/sync or MIDI in/out. So if your set relies on these things then the V4 is still your buddy. Looking at the basics, however – mixing audio and video – with more, higher quality inputs and outputs, and at 80% of the price (here in Australia AVM02 Street $1400, V4 Street $1750) the AVM02 is a very serious competitor to the V4’s throne. To me this is the most important aspect of this device, it provides much-needed competition in the VJ mixer arena, which up until now really has been owned by Edirol. Consequently they’ve kept their prices static, have kept units scarce (last time I tried to order a V4 in Australia there was an 80 day waiting period) and haven’t upgraded it for years. Hopefully the AVM02 might prod them into action. Obviously there’s plenty of testing and tweaking to come. While I have the V4 here as well I’d like to run some A/B quality tests, but if there’s anyone out there who was waiting for confirmation that the product is real before they go out and get one: Go, buy one now before people catch on and they’re all sold out.